Please note that this article relates to the basic principles of creating an Art teacher resume. There are multiple variants and multiple issues related to individual resumes depending on qualifications, experience, and expertise. Mandatory information – Mandatory information may include licenses, certifications, systems certifications, materials certifications, and other documentation. Be sure that your resume contains all the required information. Qualifications and experience – Art teaching qualifications may include a true menagerie of skills and certifications. The big issue for the resume is to show that your qualifications and experience meet the needs of the role, especially for a resume for kindergarten teacher. Otherwise, people won’t leave their child with you! Heading – Name, phone number, email, and address. Personal profile/ summary/ objective – This section is your introduction, describing your career, achievements and your work. Skills – This section is critically important, and can be a major space management issue. You need to show your skills in context with the requirements of the job, but you may also need to show additional areas of expertise, like media, etc. Use a flexible layout to show all your skills and manage space effectively. Employment history – For experienced Art teachers, you may need to “edit” your work history to fit in all the required experience. For newly qualified art teachers, focus on academic achievements in the required subjects. The good news for Art teachers it that the functional resume format makes it easy to edit and manage your resume information. Skills – This part of your resume is ideal for showing high level skills and abilities. You can use specific skills to show your suitability for the jobs. Experience – This is a true bottom line area. Schools want people who can prove they can do the work and have the knowledge and skills to self-manage their roles. Focus on practical values. According to the BLS, anticipated job growth for teachers in the US in the next decade is 6%, or 52,900, for the years 2012 – 2022. Median pay is $55, 050, based on average pay and distribution of art teaching positions at high school level. 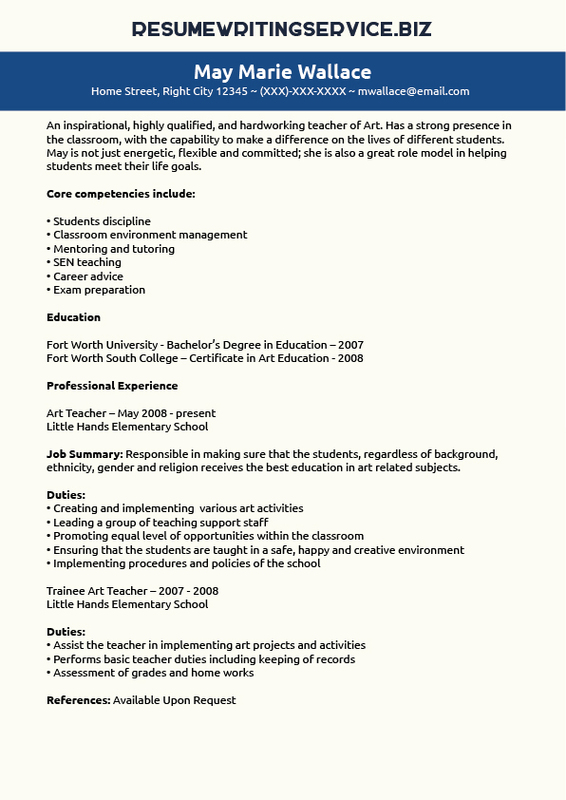 For an art teacher resume, feel free to get in touch with us today!